ProbeForum • Thema anzeigen - Tail lights "Lexus style"
I'm french and member of the PCDF (Probe Club De France), that I hope you're knowing (I'm not sure I can put the link here). First of all I'm happy to see you've got an english section, because I'm sorry not to speak german at all. As you can see, the Probe on the picture is tagged "NTC" all around its body, but when I contacted them they answered me that it's a customers car (not their car) and they don't know anything about this guy (no way to contact him). Is it possible the car doesn't exist and is just a photoshop work? Is it custom tail lights (unique made)? Is there a place where to buy them? there are some expressions, you don't know how to explain in English. J'ai eu aussi français à l'école, mais c'est longtemps. Mais pratique ne nuit pas sûrement! I'm very sorry, but you will not have any success in searching for that taillights in Germany, too. NTC, a lot of people did it before, but as far as I know, nobody ever got an answer. YES, but tuning of the 90ies generations - not tuning of the year 2005,6,7! Thats not acceptable, I'm sorry! Your french writing is very good!!! you mean the tail lighst from the ford probe? 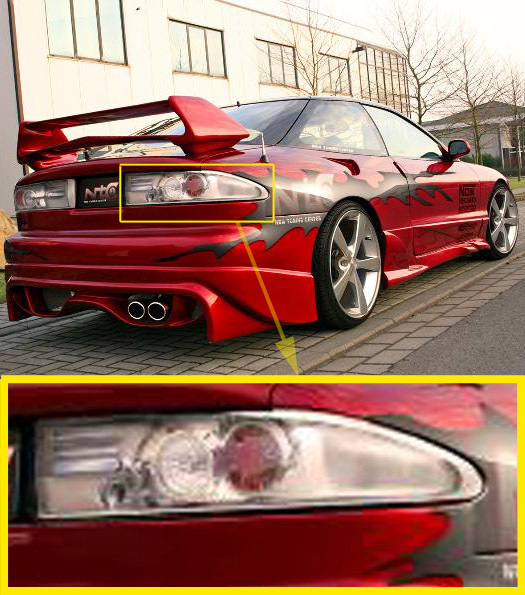 Sorry but this car is from a customer, and we don`t know, where he buy this tail lights sorry. Do you want Aline's personal Email ??? In my opinion, a Probe has a so nice body that it doesn't need any tuning. The outside (and also inside!!!) is always at the top in 2007. The only thing that looks old are the lights. I put "karglass" front lights with a HID kit to have a correct lightning for night driving. I put white leds in marker lights to follow with the ice white of the HID. I put crystal side repeaters instead of the orange ones. I replaced the 4 original lower lights (2 foglights + 2 drivinglights) with 2 smaller Hella ones (doing fog + driving in a single light), very respecting the Probe's line and perfectly integrates themselves in the original front bumper. Now I think (but it's only my opinion) that the last thing to do is to find tail lights that doesn't seem too old. I don't try to find "Lexus style" exclusively, but something more close to actual cars.